While this is not really a recipe, I wanted to share this unique presentation idea with you. I found it in a book an old friend gave to me for my birthday, The Ice Cream Book. 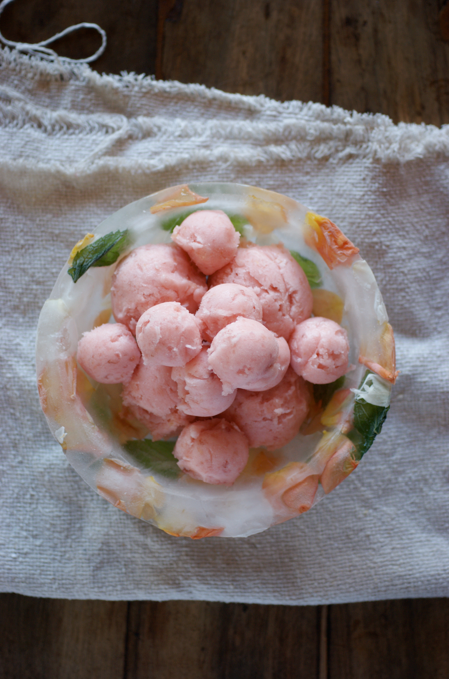 It's a bowl made of ice set with petals and edible leaves which becomes the perfect setting for any iced dessert - ice cream, sorbet, sherbet etc. 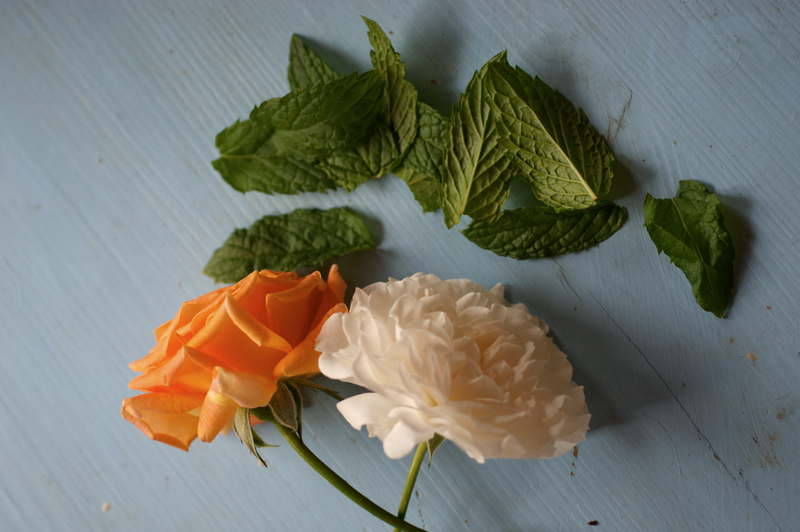 I decided to make mine with some roses and mint leaves from our balcony garden. I was was too impatient to wait while some ice cubes froze so I used some blueberries instead. You can't see them once you've put things in and I think they look pretty anyway. I decided to fill mine up with some of my White Nectarine Sorbet. My big ice cream scoop is having a tantrum at the moment so I ended up making more little ones with my melon baller. I think this is an incredibly gorgeous way of presenting iced desserts. It would help stop them melting for a little bit longer too. Give it a try - it's so easy and doesn't cost you anything. Make sure your bowls fit together leaving a clear space in between. 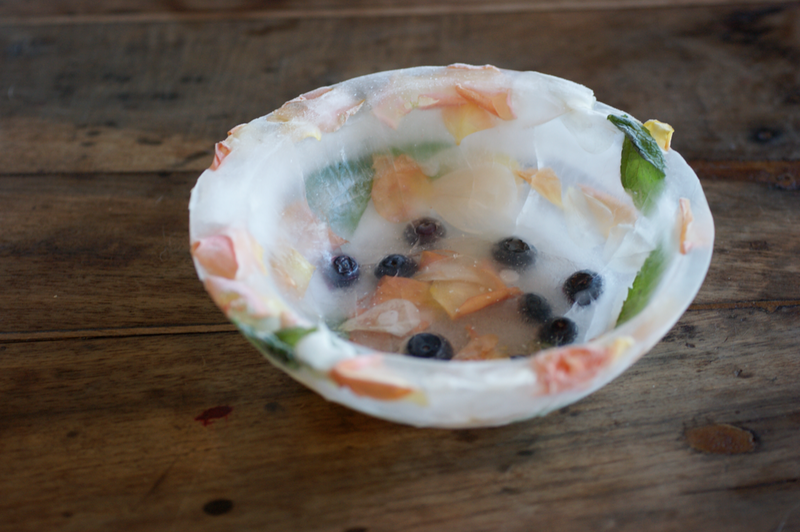 Put the ice cubes/blueberries in the bottom of the bigger bowl together with a few leaves and petals. Put the other bowl inside, making sure it is even. Place the weights in the bottom of the smaller bowl. Fill with water until it is starting to come up the sides. Carefully put in the freezer for 2-3 hours. 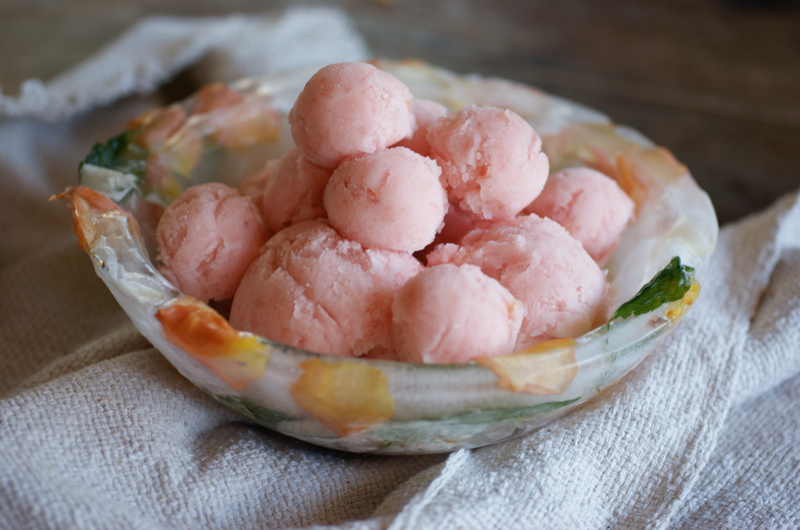 Remove from the freezer and place the rest of the petals in between the bowls. Fill with water up to the desired level. Put back in the freezer and freeze overnight. To remove from the mould, remove the weights then pour some hot water into the small bowl. It should lift out easily aster a moment. Then either pour more hot water over the base bowl then remove, or put in a bowl of hot water and remove like that. Return to the freezer. A few hours or so before serving, scoop up the ice cream/ sorbet and place in the bowl. Return to the freezer until you are ready to serve. What a beautiful and original presentation. Love it! O that look delicious and lovely. p.s. 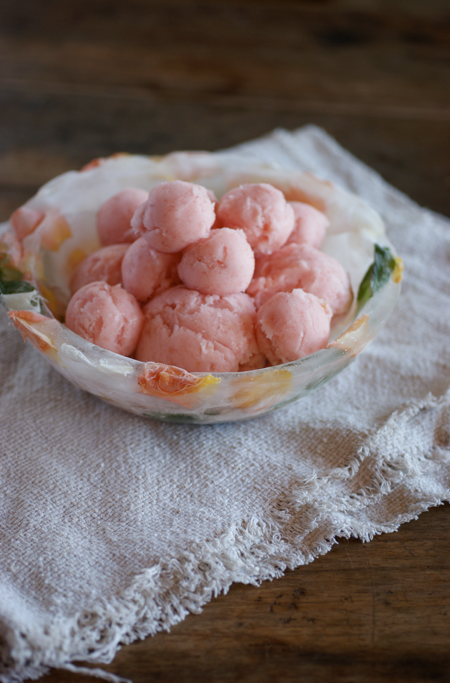 I am a little obsessed with your blog, its beautiful and I love so many of your recipes. Looking good! I've seen these made before and would love to have a go myself. Wow! It's gorgeous! And so unique. I've never seen anything like it before. Okay... THAT is cool! Beautiful!